Among the maggots that breed in the corruption of poetry one of the commonest is the bookworm. When Athens had decayed and Alexandria sprawled across the Egyptian sands, when the Greek world was filling with libraries and emptying of poets, then first appeared that Professorenpoesie which finds in literature the inspiration that life gives no more. The Alexandra of Lycophron, which its learned authors made so obscure that other learned authors could make fortunes explaining what it meant, survives as the first case of this disease and the first really bad poem in Greek. The malady reappears in Rome in the work of Cinna and Propertius; it has recurred at intervals ever since. Disconnected and ill-knit, loaded with echo and allusion, fantastic and crude – such is the typical style of Alexandrianism. Readers of The Waste Land are referred at the outset to a work on the origins of the legends of the Holy Grail by Miss J L Weston, a disciple of Frazer, and to The Golden Bough itself. Those who conscientiously plunge into the former will learn that the basis of the Grail story is the restoration of the virility of a Fisher King and thereby of the fertility of a Waste Land, the Lance and the Grail being phallic symbols. While maintaining due caution and remembering how “Diodorus Siculus/ Made himself ridiculous/ By thinking thimbles/ Were phallic symbols”, one may admit that Miss Weston makes a very good case. With that, however, neither she nor Mr Eliot can rest content. Miss Weston is clearly a theosophist, and Mr Eliot’s poem might be a theosophical tract. The sick king and the waste land symbolise, we gather, the sick soul and the desolation of this material life. It is hard not to regret the way in which modern writers of real creative power abandon themselves to the illusion that they have philosophical gifts and a weighty message to deliver. In all periods, creative artists have been apt to think they could think, though in all periods they have been frequently hare-brained and sometimes mad. Now, we have the spectacle of Mr Lawrence, Miss May Sinclair and Mr Eliot all sacrificing their artistic powers on the altar of some fantastic Mumbo-Jumbo. Perhaps this unhappy composition should have been left to sink itself, but it is not easy to dismiss in three lines what is being written about as a masterpiece. For at present it is easy to win the applause of the blase and the young, of the coteries and the eccentricities. But a poem that has to be explained in notes is not unlike a picture with “This is a dog” inscribed beneath. Not, indeed, that Mr Eliot’s notes succeed in explaining anything. The main function of the notes is to give the references to the innumerable authors whose lines the poet embodies, but the borrowed jewels he has set in its head do not make Mr Eliot’s toad the more prepossessing. 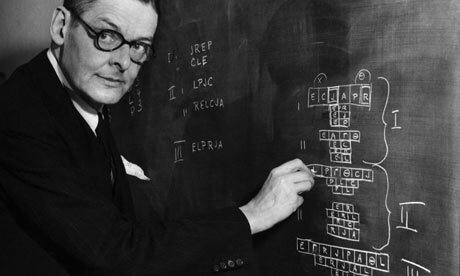 In brief, in The Waste Land Mr Eliot has shown that he can at moments write real blank verse; but that is all. For the rest he has quoted a great deal, he has parodied and imitated. But the parodies are cheap and the imitations inferior. Among so many other sources Mr Eliot may have thought, as he wrote, of Rossetti’s Card-Dealer, of Childe Roland to the Dark Tower Came, of the Vision of Sin. But the trouble is that for the reader who thinks of them the comparison is crushing; The Waste Land adds nothing to a literature which contains things like these. This entry was posted in F.L. Lucas, Modernism, poetry, T.S. Eliot. Bookmark the permalink.